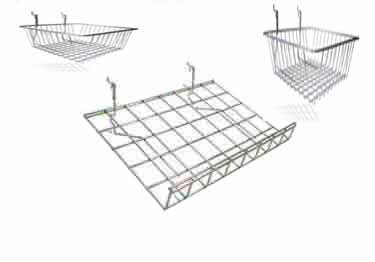 KSC Pegboard Shelving and Baskets are available in a variety of styles, colors, and sizes. Great for storing or displaying items in workshops, factories, garages, retail stores, and more. Are the prices reflective of 1 individual shelf? Or is this for a bulk order. $50+ seems extremely high for one shelf. Heavy Duty Peg Hooks let you hang small items up to 15 lb power tools safely. 17 hook styles, peg locks, safety tips. PegBoard bins, trays and organizers great for storing and organizing screws, nuts, craft supplies or any small items. Heavy Duty Metal Pegboards display, hold up to 1 ton and available in a variety of metals and colors. Pegboard tool holders and organizers are great for storing screwdrivers, wrenches, saw blades, power tools, and more!